Samsung Electronics have unveiled the SPH-V5400 handset [.jpg image], the first-ever mobile phone with an internal hard disc drive. The company’s latest innovation, which also comes with a mega-pixel camera, is currently being exhibited at ITU Telecom Asia 2004. The phone is equipped with a 1-inch diagonal, 1.5-GB hard disc drive; conventional cellys have a maximum of about 100MB of RAM memory. The breakthrough product will be available for Korean consumers in mid-September. 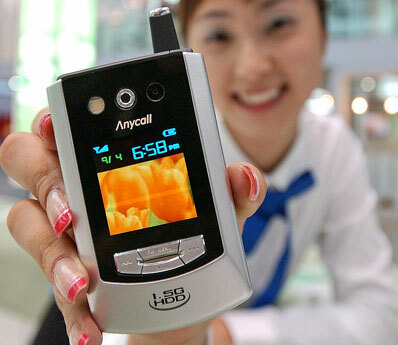 In addition, the phone boasts a high-resolution (QVGA) 2.2-inch liquid crystal display and includes features such as an MP3 player, an electronic book reader, and Korean-English and English-Korean dictionaries. A powerful microphone enhances the camcorder function, while dual speakers provide a 3D sound effect. Via: Gizmodo.